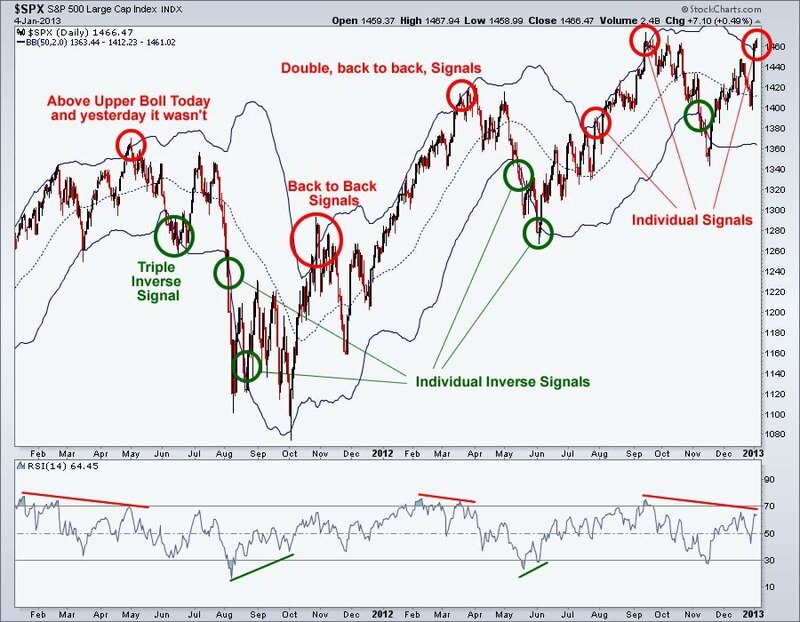 5 $SPX Closes Above the Upper Bollinger Band: What Happens 50 Days Later? Really interesting. I recall the previous comments about an abnormal market – it just exploded upwards, didn’t it? Maybe from HFT, hedge funds, nervous retail investors? It was a great post, in any case. Bruce Krasting has a post (http://brucekrasting.com/bernankes-legacy-problem/) about the Fed’s latest minutes, which many took to be an indication of early rate increases. But, several commenters thought the Fed did that just to head off a moonshot from the market, just like what you describe above. We still might see $4 copper and $110 oil. I don’t think the Fed will do a damn thing except keep buying bonds. Thanks for the Krasting link! How would you read this on the shorter time frame of the last 2 years in an exhaustion context? Hmm. Not sure. So I just re-ran the test from 1.1.2011 to 1.4.2013. 10day hold = avg. profit/loss of -0.16%. 3 Winners, 4 Losers. 25day hold = avg. profit/loss of -1.42%. 1 Winner, 5 Losers. 50day hold = avg. profit/loss of +1.48%. 3 Winners, 2 Losers. I’d say over the past two years it has led to some exhaustion over the next month. The key point for me though is while the market may look over extended, historically it hasn’t fallen apart enough after this type of setup to warrant aggressive shorting. Instead of using the negatively charged word “exhaustion”, I should have more accurately said “in a triangulating, rising wedge environment”. The market looks tired to me when looking at the short to intermediate term (I’ve got another chart idea to illustrate that I’ll post once I’ve put it together), but I’m starting to think there is more longer term strength than I have been giving credit, something like the marathon runner who hits the runner’s wall but then gets a second wind. Your shorter term re-run of the test is more confirming evidence of possible short term weakness before we get a clear resumption of the longer term uptrend. Very nice signal indicator BTW. While it may not exactly identify either trading range extremes or an early new trend breakout, it certainly helps to clearly show where either one or the other will probably take place. 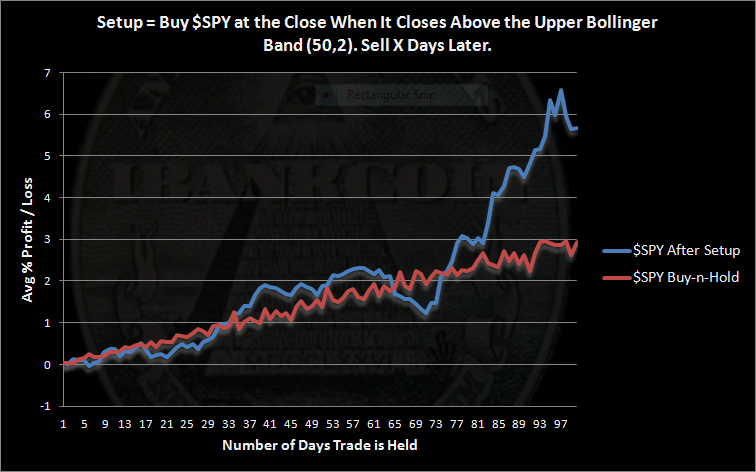 I’ve been working on a top/bottom spotter group of indicators, and I’m going to add the Bollinger 50,2 to the group! Here’s a link to further comments (that also complement my latest post) and that chart I mentioned.